Matt Carpenter returned to the St. Louis Cardinals‘ lineup Tuesday night after getting a few days off to regroup. Now, it’s Dexter Fowler‘s turn to get back on track. Fowler is expected back among St. Louis’ starting nine Wednesday when the Cardinals wrap up a two-game interleague series with the Minnesota Twins at Target Field in Minneapolis, Minn. The center fielder was expected to be a sparkplug atop St. Louis’ lineup this season, but both he and Carpenter got off to the worst offensive starts of their careers. Carpenter was batting .145 and Fowler .146 when the Cardinals arrived in Minneapolis. Carpenter went hitless on Tuesday and his average is down to .140. 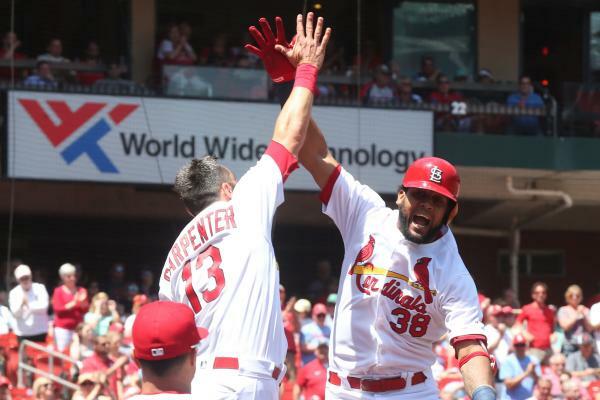 Fowler went 0-for-6 in St. Louis’ 2-1 victory Saturday night and spent nearly an hour in the batting cage after the game, trying to find a way out of his funk. “No one likes to (stink),” Fowler told the St. Louis Post-Dispatch. Cardinals manager Mike Matheny had considered starting Fowler Tuesday in the series opener but opted to give him another day off and said he has kept Fowler in the loop the entire time. “Something is just off,” Matheny said. “If you can pinpoint it, you’d fix it. ‘Oh, I found something!’ That’s typically the conversation. But that’s after days of repetition and after lots of sleepless nights trying to figure it out. You grind your way through it. If Fowler does return Wednesday, he’ll be greeted by a familiar face as right-hander Lance Lynn takes the mound for Minnesota. Lynn spent his last six seasons with the Cardinals, going 72-47 with a 3.38 ERA. Lynn turned down a $ 17.4 million qualifying offer from St. Louis and didn’t land with the Twins — who signed him to a one-year deal — until late in spring training. Lynn didn’t face the Cardinals when the Twins visited St. Louis last week, but didn’t mince words about his departure. But he’s gotten off to a slow start in his new home. Lynn is 1-3 with a 7.34 ERA through seven starts this season, and he allowed four runs on eight hits and two walks on Friday against the Angels in his last outing. He was bothered by a “stinger” in his back and hip during the start, but still managed to go through 4 2/3 innings. Right-hander Miles Mikolas (5-0, 2.51 ERA) gets the start for St. Louis. He allowed just a run on five hits while working 6 2/3 innings against the Padres on Thursday to record the win. Wednesday will be his first career appearance against the Twins.